I purchased what was suppose to be 75 pounds of the Deepwater Vava'u from the same place. They sent me 50 pounds and then they tried to convince me that 25 pounds of water had either drained or evaporated from the rock in transit from Tonga and that this was completely normal. There is no customer service with this place in my opinion. "Too bad" is exactly the attitude I received as well. I was very unhappy with my experience ... you're taking a chance in my opinion when ordering from this company. With that why are you fighting that battle? Sounds like a long time member that could fight the battle himself. Besides it's a complaint, but not the same as yours. As long as you are quoting one negative how about any postive posts? I know it is a little late, but thought I'd chime in. I also couldn't find any solid info or opinions on livestockusa.org, so decided to go for it and then do a write-up. I bought a 75# box of Eva. In short, the service from livestockusa.org was stellar, the rock is better than anything I have seen in LFSs around here, and came out well under half the cost with shipping charges included. How well it stacks up against some others, I do not know. Anyone care to comment? Also why buy live rock from one site and follow instructions from another? Other than you just shopped price? I see pics of the rock that you got in the box where are the bugs that were on them? 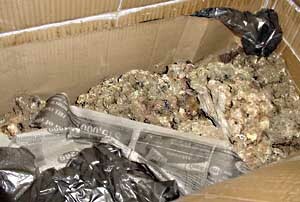 This look like alot of other live rock that I have seen shipped into stores ... you will get die-off. By no means do I want to make you feel bad, especially because you are a newbie. I think if you give the rock a chance you will be happy. I also would advise you not to try everything that everyone tells you or that you read. Stack that rock creatively and let it grow and definitely let's see a post in a few months to see what that tank looks like. Wow this is really something, eh? I apologize for the length, but the incorrect record demands straightening out. First, I want to say we are truly very sorry that Damselblue is not completely happy with her rock. Second, I want to say that it does not look like our "fanciest stuff" that is usually shipped. Third, like all customer comments and feedback, we take it very seriously ... for instance, the photos will be sent to Fiji. That said, I'd like to point out that Damselblue's pictures do not look like the rock she received. Not to dis Damselblue's photo skills, but the (probably digitally-determined) exposures are very dark (under exposed) and very light (over exposed). What you lose in either case is color. Over and under exposed photos do not show the true story. We wanted to see a more true (real) representation of what Damselblue's live rock looks like under proper lighting, so we took her pix and used Photoshop to adjust only the lighting levels ("auto levels" adjusts for the under and over exposures automatically, to some degree, but it can only do so much). It does, however, result in a far more accurate depiction of what Damselblue received rather than the raw, incorrectly exposed images posted here. And when done, the rock looks more than twice as colorful as the images that were posted here. If the exposures had been accurate to begin with (not Damselblue's fault), it would be even more colorful than simple "auto levels" adjustment working with poor exposures. So what is being touted as what was received is not 100% accurate. As a life-long photog, who learned it in the darkroom with black and white, I have taken a thousand live rock pictures. 800 went into the trash. It is amazingly hard to take a good picture of it. On Damselblue's in-the-box shot where newspaper covers half of the box (the good pieces? ), there is a strong yellow cast, which is usually incandescent lights overhead. The way to remove blue-violet from the spectrum is to use a yellow filter or lights. With fluorescent lights for instance, a Series 7 80B filter (yellow) is required to remove the blue cast of fluorescents. That this is a factor is visible in Photoshop where you can see what is showing up in the spectrum. The blue-violet end of the spectrum is flat-lined. There ain't nuthin' there. It is not Damselblue's fault, it's just how light and color work. But, I think she knows that the pictures look worse than what she is looking at (as "auto levels" proves) and no effort has been made to make that clear to the fine folks reading this. I'm not sure that is fair to them, or us. Okay, let's take a look at what Birdfish is explaining ... on the left is Damselblue's original ... on the right is the photo with the lighting adjusted. Often the pieces are packed upside down so the uncovered with coralline side (bottom) is facing up, as shown in one of Damselblue's pictures. This is to protect the "best stuff" during shipping. Note we have a photo gallery that has many dozens of pictures in an attempt to show the range of possibilities. The bottom line is that in our view, Damselblue has not been altogether forthright, possibly to garner support for her position. A number of the things publicly posted are patently false (either not things that were ever said, or, things that were never on our website), and nothing more than creative novel writing. They are simply a twisting of words and facts for effect. Has it been the truth, the whole truth and nothing but the truth, first time, every time, all the time? Unfortunately the answer is "no." Damselblue - 1) "I showed others on The Thread and they totally agree with me." Obviously this is not and was not ever true. A falsehood. Not true, and how could Damselblue know? There are four shippers in Fiji. They all collect in many different areas amongst the many islands. Damselblue - 3) "I DO REMEMBER READING ON YOUR SITE TO DO A DIP THAT CONSISTS OF 1.030 SG! Then you took it down." We will take and cover any and all bets with no limit (!) that such a thing has never been on our website. We have archived versions every few months, for years, and server records, that we can provide to prove that. When you say we said something that we never said, or that we "took something down" that was never there, bells and sirens go off in my head. A falsehood, again. We have (and will) never recommend a hypo-saline dip. Damselblue - 4) "If those pictures are straight from Fiji, you should state that in your website those pictures were taken IN FIJI, not when they arrive." I said the pictures were taken in transit. Apologies for not being more clear. They were taken in Los Angeles as the boxes were opened on the way to customers as part of our quality control program. Damselblue - 5) "He also told me to keep the rock in a low salinity which people say to keep it at least 1.025. He says 1.021." According to a $10 book I feel none of you should be without, "The Marine Aquarist's Manual" by Hans A. Baensch, published by Tetra 1983, page 71 has a graph that should be of import to reefers. It lists the average density (SG) of each ocean: Pacific=1.021, Indian=1.023; Caribbean=1.024, and Red Sea=1.027. It also lists average ppt and temps for each ocean. 1.021 is not "low" for the Pacific, where Damselblue's rock came from. Damselblue - 6) "The people that sent me the rocks said to keep temps at 71 with an SG of 1.021." Another falsehood. We have never suggested a temp of 71. Our curing page states 73-75 are our preferred temperatures, and states that though this seems a little low, the idea is to provide a buffer against summer overheating, and increase oxygen levels and oxygen reduction potential (ORP), all of which help the cycling process. Also note contrary to some other posts here, in Tonga, the water is 72 degrees F.
Damselblue - 7) "There is maybe 5% coralline algae on the rocks I purchased." This is clearly false too. We feel for Damselblue's disappointment, however, it's not as bad as she's been making it out to be, and, we are sure, in short order, she will be amazed at how her rock looks. Hopefully, she can post pictures here in a month or two and show us all how it looks. I will respond to the "alleged shorted customer" post seperately. Suffice it to say, I have tried for 5 years to get Tonga to ship 50 lb. boxes. They won't yet, except for branch rock. That customer (thanks for posting it!) received a partial refund to the account from which it was purchased from, last March 3. The *total maximum* disputed amount is 13 pounds, not 25, and is far closer to ZERO. But, as with most disgruntled customers, the tendency to exaggerate is seemingly irresistible. Fortunately, we can count them on one hand. No one EVER told us they were shorted 25 pounds and that customer's initial e-mail states it was 20 pounds short (and that was before our partial refund), not 25. We have all correspondence for verification. Finally (WHEW!!) I would like to thank all of the informed, intelligent folks who knowledgeably participated in this thread, some of whom I would really like to have a beer with! Note that the advice Damselblue refers to came from another source or website (which may not necessarily be considered "good advice" in caring for live rock) ... it appears that Damselblue was visiting many different websites in gathering her information ... could it be possible that Damselblue got some of the information she gathered confused? 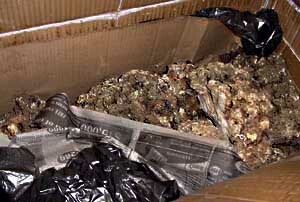 "I was told if I bought 75 pounds of the Eva Live Rock, it would be too much. So if I bought 80 pounds of the Fiji Live rock I would think that would be too much. This is a 40-gallon breeder. 36x18x16. I will have about either a 6-10 gallon refugium. I will place a couple of pieces in there to grow pods for my mandarin. It will also have a deep sand bed. I've read the facts on the live rock. I am worried about whelks, sea spiders, mantis shrimp, and other bad hitchhikers. I am just afraid I would not be able to spot a whelk or the others might hide and I might not be able to find them. I could always take out the rock and as advised, place some carbonated water in holes or use a wire to see if anything is hiding in there. Just wanted to know what you guys thought. I think I will go with the Fiji because it is least expensive. It's all I can afford right now." Thanks Birdfish, I like hearing from you!!! Like I had said before I have and will order from you again! Hopefully others will not take Damselblue's experience as the norm with your company, because it is not the norm. Damselblue ... your rock will be fine, if you are that unhappy with it sell it to a local and order again. Even though you had a bad experiance I would try livestockusa again. I have seen lots of rock from other online retailers and none has compared with theirs. The divers must have had a little too much rum the day they packed your box. Hiccup ... in Fiji, it's actually kava! Damselblue, I'd just like to tell you that coralline algae grows best under pc or t-5 lighting. Metal halide burns coralline and in fact is too much light for it, so if you're looking to get more coralline, keep your M-H's to a minimum. Also, I just posted a thread about this for us to learn more, so read up when you get a chance. I'll take the kava! I hear Prince Charles even tried it! What's kava, you ask? It's an intoxicating drink made from the roots of the of the kava plant (a type of pepper). It's used in certain rituals. I hear it's a little hard to swallow. I think I could stand a bit of kava myself right about now!